I have a bad attitude sometimes, particularly regarding sightseeing and the tourist experience. It’s a necessary and often rewarding part of the trip, but we’re both learning that we don’t really like sightseeing. It often seems like the many of the things we see are significant because someone with dollars in their eyes decided to make it significant. Either that, or the significance that is experienced by others is lost on me. Maybe I am shallow or cynical or unsophisticated, but I will be just fine if I don’t see another “important” image of The Buddha for many years. The same is true for many temples. Long before we reached China, we started to recognize that we rarely leave a temple saying “that was so great!” or “I’m so glad we came!” Usually it’s more like “Hmm, another temple.” We call it temple fatigue. Another example occurred just today at the Summer Palace in Beijing, which is, by all accounts, an impressive sight of imperial grandeur. Inside the palace grounds (and also in the Forbidden City) there are very important rocks with names like the “Blue Iris Stone” which are accompanied by a story of an who emperor found the rock and had it shipped to the Palace at great expense. So there it sits, surrounded by a railing and sitting on a pedestal – a rock. It’s not sculpted, it’s not shaped, it has never been used for anything or changed in any way, it may be in the shape of something recognizable and is certainly a rockish, yellow/gray hue (despite being described as “black and sleek”). There is no doubt that it is a rock that someone could have found at any moment in history and is one of about 1 gazillion such rocks in the world. To the admittedly undereducated like myself, it appears just as it sounds – a rock – on a pedestal - surrounded by a railing. 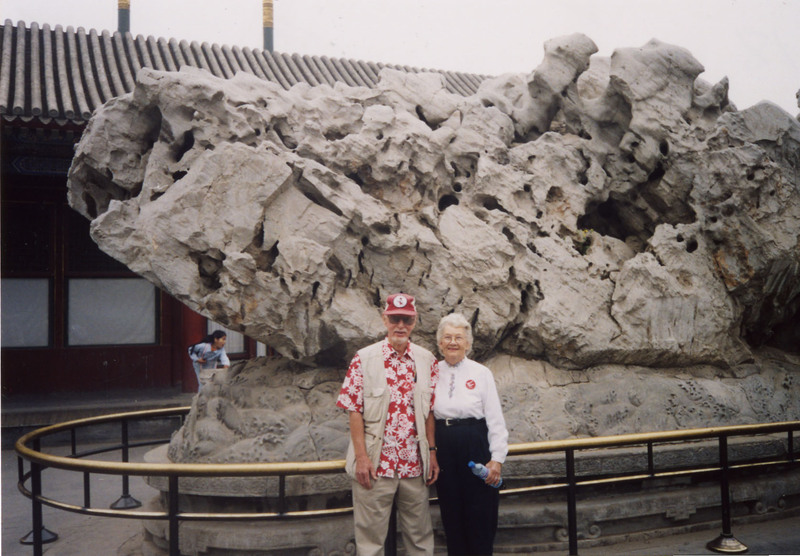 I’m not sure how a rock becomes an item of Chinese culture, but many have and people quite literally line up to have their picture taken in front of it. I have to wonder though, am I being cynical and shallow or am I being realistic? We’ve seen it happen before in tour groups – the guide makes a big hairy deal about something and the group eats it up and prepares the cameras without thought. This is where the tourist experience blends a little too closely with dollar signs. Tour groups need sights and the more the tourist is convinced that they are seeing something significant, the more likely they’ll actually find some significance. So, from my perspective, a strong percentage of what a tourist sees is filler – something to make the tourist feel like they are having a great experience in between the things that are really impressive and important to them. I think this gets to the heart of why I loath tour groups – too much filler and not enough time to independently figure out what is significant to me. It reminds me of Las Vegas and seeing people very excited to take a picture of a replica of Michael Angelo’s masterpiece “David” at Caesar’s Palace. I just want to say to them “That is not art you know, it is not historically significant, it is a piece of plaster put here for decoration alone.” But it doesn’t matter, they think it’s great and who am I to judge? All this is leading to the realization that I don’t like sightseeing. I yearn for reality or a historical and observable connection to the reality of a city or country. Modern history is endlessly fascinating. The spread of Communism in Asia, Mao Zedong, Pol Pol, Ho Chi Minh… I cannot learn enough about that part of history. Anything before about 1900 becomes somewhat opaque to me. I can’t see as much reality in it or how it is affecting a country now. What really does it for me is learning the modern realities of a place – the politics, the social issues, the transportation system, food, what locals do, say and wear day-to-day. For me, this is endlessly real and represents something that I can grasp in my view of the world. Rocks and temples? Not so much. I will gladly continue to see sights and learn about history, but I’ll do it recognizing that there is a curiously real, entertaining and interesting aspect of tourism and tourists that can be quite rewarding to observe, even if the sights are not. Travel fatigue happens to everyone. Onset can be recognized by giggling whenever someone says "Hey look, another waterfall" in a national park or "Do you want to stop at this chateau?" in Europe or "The sign says this is the largest sitting indoor iron painted Bhudda in this province" in Asia. You sound a little down, and I know it'll pass. Your blog is one of my must-reads in my ever-more crowded reader. I guess there are two interesting things about these rocks to me: 1) they've apparently been collected and prized in China for at least a thousand years, and 2) everybody I know who's been to China reacted the same way you did. So they're historical and kind of funny. What's not to like? Re the Buddhas, maybe you saw too many. For me, I've always thought (naively) about China as a civilization not much disturbed by external influences, so it was neat to be reminded of the vast impact this "foreign" religion had on China. Strange too to learn that one of the major landmarks of Beijing is actually a Tibetan Buddhist temple (Baita Tower). Or is it here here...anyhow, right on brother. Travel fatigue can wear on the best of us. My absolute favorite thing to do is to walk around and try to see what the locals do on a day to day basis. Not only that but I can't get enough of outdoor local markets and grocery stores. Temple smemples...at least that's what it feels like after the 300th one. Travel safely! Love your website! Just a quick thought. I traveled by myself in Europe for 2 weeks and I never bothered going on any guided tours. I found it much more fulfilling to just rent a bike or walk through the city and take in the culture. I had friends that did group tours together and they always left me wondering if I was missing out on something unique, but your post justifies my decision to go it alone. Cheers to Brye's comment about local marektplaces, they're a great place to see how people interact with oneanother. You always notice some interesting characters too, like 'weird toe nail' guy, or Chinese Bob. Great blog man.